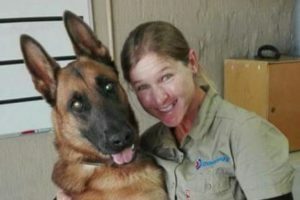 Elmarie Estebeth is SafeLane Global's Kennel Master at the South Africa dog training school. Elmarie Etsebeth grew up in Pretoria, South Africa. As a young girl she was shy around people because of her quiet nature. It’s fair to say she always found it easier to relate to animals and be around her own dogs and horses. As a result, many people advised Elmarie to work with animals. However, in terms of her initial career path, Elmarie’s life took some odd turns, and she could not get settled on one job. None sparked her passion, all were just a means to an end. 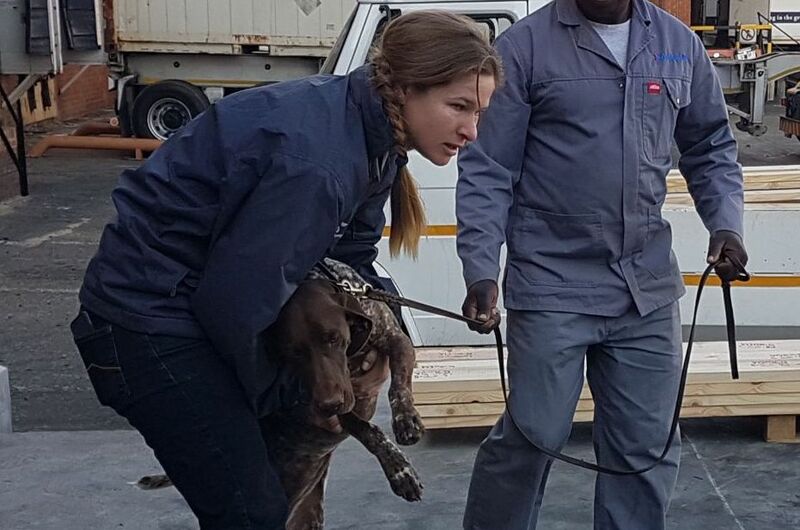 She knew Talitha and what kind of work she did, so one day Elmarie gathered her courage and asked Talitha for an opportunity at the dog school because it was her dream job. To this day, Talitha remembers exactly what Elmarie said: “I will work very hard as long I can work with dogs, it will make me the happiest person in the world.” And the rest is history! Today, Elmarie looks back at this memory as the positive turning point in her life. What was your early life like at the dog school? I started working at the dog school in 2014 and had many tasks: grooming, walking, fetching dogs for the trainers, cleaning the kennels and weekend working. I know Talitha didn’t think I would last because it was very hard work! But, as the months passed I proved myself – and fortunately for me, Talitha decided to involve me more in the dog school. I started working as a dog handler, and stayed in that position for a couple of years. I got plenty of training with other handlers and trainers coming and going through the school. I put myself through every single training opportunity I could, and took personal responsibility for advancing my education. Today I have progressed and am one of the trainers at the school, and I am the kennel master. Tell us more about you and your role at the school. First of all, I would like to say thank you to SafeLane Global and to Talitha for believing in me and shaping me as a professional person. Where I am now in my life I am living my dream to work with animals. I think I proved myself to Talitha through my hard work and absolute dedication – and I can say I will never stop proving myself or improving through education and practice. Secondly, SafeLane Global and Talitha have taught me to be more motivated and have a very positive outlook in life, in achieving my personal goals plus working together as a team. The best bit of my job is training the dogs. I get this huge satisfaction through seeing how they learn and the progress they make in their training. To bond with that one dog at that one time, and see the love they give you back – well all the sweat and tears are so worth it and it is the best outcome of everything. I think that is the nicest part of my job! In July 2018, I got the opportunity to travel to Somalia for a site visit. It was for me exciting and challenging because I never had experienced something like this to travel to a war-torn country by myself. So, you can imagine what went through my mind! It was a good experience so see what is happing on site and how the dogs I trained are now working. It was also great to see how the other trainers are now training my dogs! My ambition is to be able to go to all the international projects and continue to teach handlers and their dogs – and to be proud of what I achieve at the dog school.